Mangaluru, Jan 24, 2019: Barkur’s ancient fort ‘Nandarayana Kote’ is all set to host the first-ever ’Alupotsava’ from January 25 to 27. The fort belongs to former governor of erstwhile Vijayanagar Empire, Nandaraya. The fort, spread across 14.12 acres of land, was covered with weeds and shrubs. It is being cleaned up for the past 20 days in order to revive its glory once enjoyed during the Alupa dynasty. The authorities have taken utmost care to ensure that the structures were not damaged during the cleanliness drive. A kalyani (Indian stepwell) situated inside the fort has been restored to its original glory following the desilting work taken up recently. 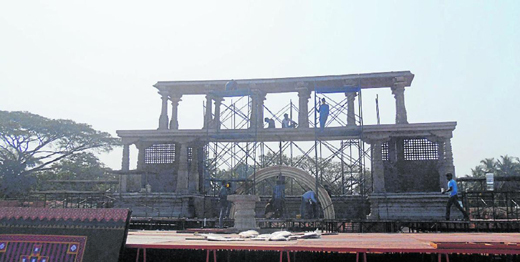 The construction of a sprawling stage, 80ftX60ft wide and 36 ft high, is under way for the Alupotsav and is named after Bhoothala Pandya. As many as 40 labourers are working under the guidance of Shashidhar Adapa of Bengaluru for completing the stage. Models of Jamboosavari and others are being used to deck up the stage. Elaborate lighting arrangements have been made to transport visitors to a different world. That apart structures and inscription dating to Alupa dynasty like horse stable, ‘Mastikallu,’ ‘Veeragallu’ and others that highlight the Tulava culture will also be decked up and showcased. As a part of the Alupotsav, a special postal cover will be released and Deepotsava will be organised at ‘Kathale Basadi.’ A seminar on Alupa dynasty is also being planned by the district administration. According to History Professor Prof Murugeshi the fort will throw light on the rich history of Alupa dynasty. It is believed that Nandaraya of Vijayanagar Empire had built Barkur which is also mentioned in the stone inscriptions found at Belman and Udyavara. According to historians, elephants and horses for Vijayanagara Empire were imported from Persia to Barkur fort. The fort also has a crumbing remains of a building what was once a palace a long time ago. A statue of Bhairava is also found outside the fort. As per the directions of Department of Archaeology, the excavation of the fort area was handed over to Srikrishna Indology and others in Delhi. So far only 10% of the area of fort has been excavated. The residents of Barkur, Hanehalli, Heradi gram panchayats have been extending all support to Alupotsav, officials said.